In 10-inch skillet, mix onion topping ingredients. Heat to boiling over high heat, stirring occasionally. Reduce heat to medium-low; simmer about 15 minutes or until onions are softened and liquid is reduced by half. Remove gingerroot slices. Meanwhile, in small bowl, mix ketchup and chile paste; set aside. In large bowl, mix beef, green onions, 1 tablespoon gingerroot and the garlic salt with hands just until blended. Divide mixture into 16 equal portions. Using wet hands, shape each portion into patty, about 1/4 inch thick. Heat 12-inch nonstick skillet over medium-high heat. Add patties; cook 3 to 4 minutes on each side, pressing patties down lightly with spatula before turning over, until thoroughly cooked and no longer pink in center. 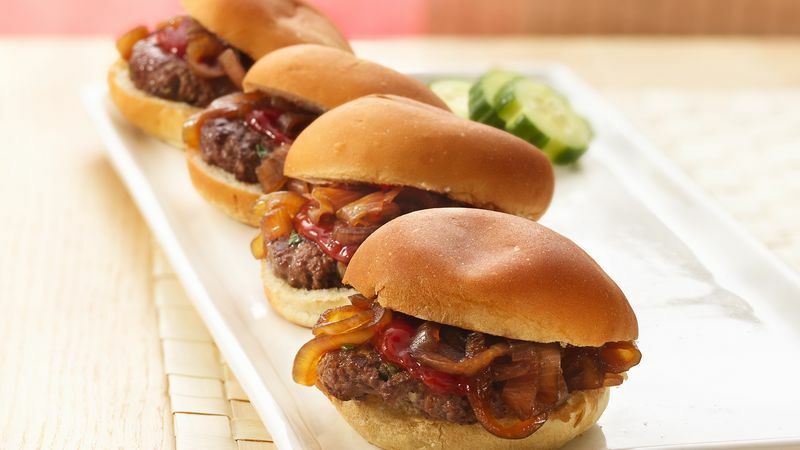 Place patties on bottoms of buns. Top patties with ketchup mixture. Using slotted spoon or fork, remove onion slices from cooking liquid; place on top of ketchup mixture. Top with tops of buns. Chile paste can be found in the Asian-foods section of supermarkets. It is somewhat hot and sweet and is often flavored with garlic. To prepare gingerroot, use a small sharp knife to peel the tough skin. Cut gingerroot into slices, then finely chop.